Without Bound - It's about time. In May of 2011 during a fishing trip on the Colorado River in central Texas, one of my friends, Dan Longtin, was talking about building his own teardrop camper. I had never seen a teardrop design but I was intrigued by the idea of a small, lightweight camper that would be relatively inexpensive to build so I decided to do a little research when I got home. In the process of searching for DIY camper designs and plans, I stumbled across cheaprvliving.com, a website operated by Bob Wells, author of How to Live In a Car, Van, or RV: And Get Out of Debt, Travel, and Find True Freedom. I was instantly fascinated. Call me naïve but I had never heard the terms van dweller, stealth camper or boondocker. My first thought was, "Why would anyone choose to live, full-time, in a vehicle?" I held the view, probably shared by most Americans, that home ownership was both a noble and worthy aspiration, providing stability, safety, comfort and even a sense of identity. I wondered how anyone could feel secure, comfortable or fulfilled living out of a van or a camper. Over the following months I continued to read numerous articles on Bob's website and found lots other interesting sources of information on the web. The more I learned, the more my attitude shifted from "Why" to "Why not?" I also thought that the topic of mobile dwelling would make an interesting subject for a documentary. I shared my thoughts with my good friend Aaron Harlan, who happened to have his own personal experience (I'll let him tell that story if he wishes) with living out of a vehicle. Aaron shared my enthusiasm for the project so I began plotting and planning. Aaron sleeping at a truck stop in New Mexico on our way to Shaver Lake, CA. Late July of 2012, a two-week window of opportunity opened for early August where both Aaron and I had no other commitments. I reached out to Bob Wells, Josh and Meisha Manwaring of vagabloggers.com and made an open request for participants through the Yahoo Vandwellers Group. Bob, Josh and Meisha immediately accepted the request as well as a couple of van dwellers from the Seattle, WA area. 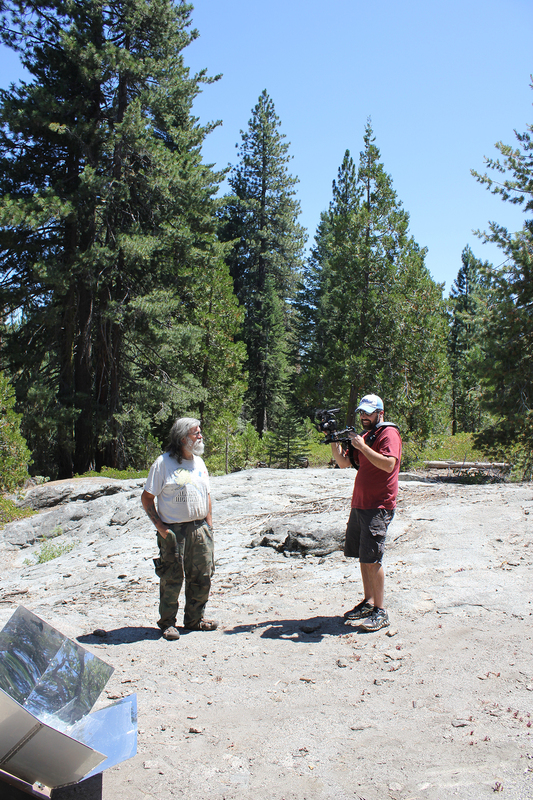 I planned our route and on August 5, 2012 we hit the road for Bob's camp in the Sierra National Forest near Shaver Lake, CA with just a handful of people willing to let us document their unconventional lives. We trusted that other opportunities would arise while we were on the road and they did. While we were in Bob's camp, he reached out to a number of other people on our behalf which led to the opportunity to interview Randy Vining, Laurie Theodorou, Steven Ballee' and Chris Carrington. They were all located in Arizona and New Mexico so we decided to cancel the Seattle leg of the trip. With the doors that Bob opened, we knew we could meet with more people if we stayed in the Southwest. During our travels, we met other mobile dwellers who didn't wish to speak on camera for a variety of reasons. Nevertheless, they were all kind, thoughtful and insightful. With tons of practical, how-to information already available on the web, we focused on the personal philosophies of the individuals. Each person we interviewed offered something special to the conversation and I hope that all who watch are able to appreciate their contributions. I came up with the title "Without Bound" months before the trip was planned. In mathematics, without bound is used to describe something that either increases or decreases infinitely. I encourage you to think about how that applies to your life. What is increasing? What is decreasing? Is the balance of the trade-off tilted in your favor? Are you happy? Is there a better way? This project started the summer of 2012 when Aaron Harlan and I traveled through New Mexico, Arizona, California, Nevada and Utah to meet and interview a fascinating group of people who choose to live in vehicles rather than traditional dwellings. As a personal interest project, it has been repeatedly postponed for other priorities like work, illness and family issues to the extent that I often wondered if it would ever be completed. I am pleased to announce that the finished video will be available Friday, November 21st at 6:00pm CST on YouTube. You can check out the trailer below. Visit Michael Tubbs's profile on Pinterest.